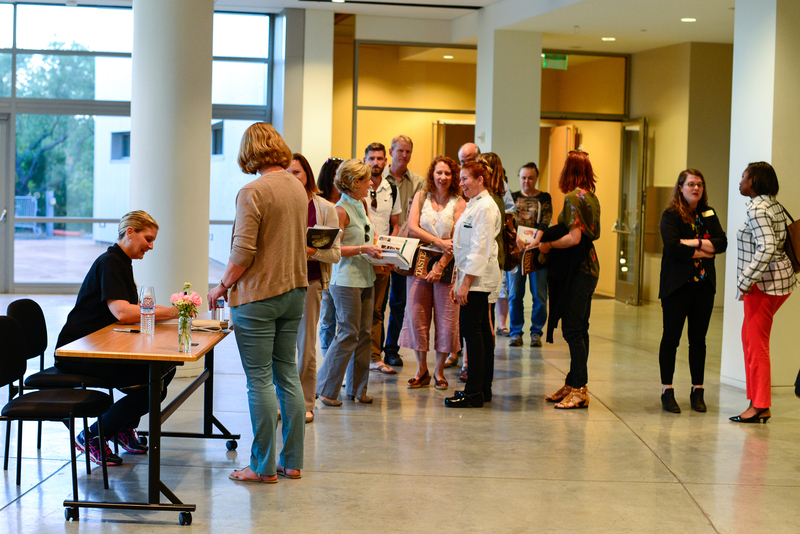 Napa, CA – The Culinary Institute of America (CIA) at Copia, the ultimate Napa Valley destination for exploring, experiencing, and enjoying the world of food and wine, is hosting a series of cookbook signings, demos, and lectures. The highlight of the series will be a pre-release reception of Wine Country Women of Napa Valley on Sunday, September 24. Below is a list of author events through November. Events will be added regularly to the CIA at Copia’s online community events calendar and store events page at www.ciaatcopia.com. CIA alumna Mary-Frances Heck will sign her new cookbook Sweet Potatoes: Roasted, Loaded, Fried, and Made in to Pie at the Store at CIA at Copia. No registration needed. This special event is a reception and panel discussion for the new book, Wine Country Women of Napa Valley, featuring author Michelle Mandro and more than 50 of the women included in the book. The book—a compilation of family recipes, honored traditions, and stories from more than 60 of Napa’s most influential women—will be available exclusively at The Store at CIA Copia until its public release on Oct. 24. Register at Wine Country Women of Napa Valley. Twenty Five Lusk Executive Chef Matthew Dolan will demonstrate a dish from his new (and first) cookbook, Simply Fish: Modern and Delicious Recipes for Sustainable Seafood. Joining Chef Dolan is Simone Jones from the Monterey Bay Aquarium to talk about sustainability issues. Register here. Join respected Italian cookbook author Rosetta Costantino for an evening of Calabrian cuisine and lively discussion. She will be signing two of her cookbooks, My Calabria and Southern Italian Desserts. Professors Magnus Rittby and Eric Simanek of Texas Christian University will discuss whiskey through the lens of science and engineering. Shots of Knowledge: The Science of Whiskey was authored by Dr. Simanek and Rob Arnold, head distiller of TX Whiskey. Register here. Authors Alex Prud’homme and Katie Pratt will be signing France is a Feast: The Photographic Journey of Paul and Julia Child in The Store at CIA Copia. American filmmaker Sri Rao will demonstrate recipes from his new cookbook, Bollywood Kitchen: Home Cooked Indian Meals Paired with Unforgettable Bollywood Films. Rao has taken his mom’s authentic, home-cooked recipes and adapted them for the modern, American kitchen. Registration opening soon. Join CIA graduate Stuart Brioza and Nicole Krazinski for an exciting interactive demonstration and tasting featuring recipes from their new book, State Bird Provisions: A Cookbook. Registration opening soon. Join CIA alumnus, chef, and 2015 Bocuse d’Or Silver Medalist and 2017 Head Coach Philip Tessier to learn about his journey to becoming the first American to medal in the Bocuse d’Or competition, as documented in his new book, Chasing Bocuse: America’s Journey to the Culinary World Stage. Demonstration by the new Bocuse d’Or Team USA 2019. Registration opening soon. In addition to book signings and demos, visitors will find much to do at the CIA at Copia, including daily cooking classes, wine tasting in the Tasting Showcase, dining, and browsing culinary and wine collections. Shoppers won’t want to miss The Store at CIA Copia, featuring an extensive collection of cookbooks by CIA faculty, alumni, and guest chefs, as well as artisanal food products, cookware, glassware, one-of-a-kind pottery, and more. The Restaurant at CIA Copia is a destination for innovative, market-based, globally inspired, California cuisine that pairs perfectly with Napa Valley wines and craft cocktails. Throughout the property, guests will find culinary artifacts, museum collections, and one-of-a-kind sculptures, which are open to the public and can be viewed at no charge.